In the early 1990s, Grunge emerged as a popular new hard rock musical style. Its characteristic image was of greasy-haired, lumberjack-shirted garage bands playing punk-metal guitar rock. Groups such as Nirvana, Soundgarden, and Mudhoney epitomized this new Seattle-based sound. 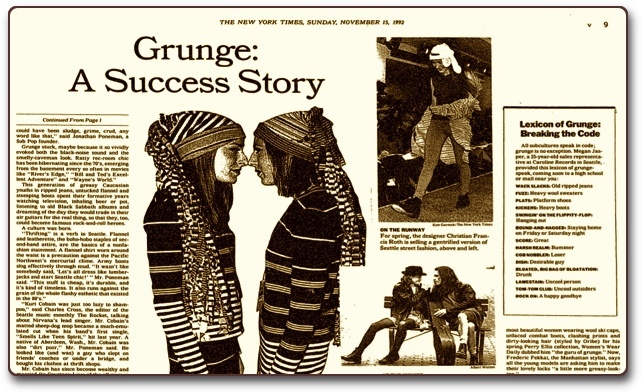 On November 15, 1992 the New York Times published an article analyzing the roots and evolution of the grunge movement. It theorized that Grungers had embraced greasy hair and lumberjack shirts as a way to rebel against the vanity and flashy style of the eighties. The Times also reported that, just like any self-respecting subculture, the Grungers had developed their own lexicon of "grunge speak." 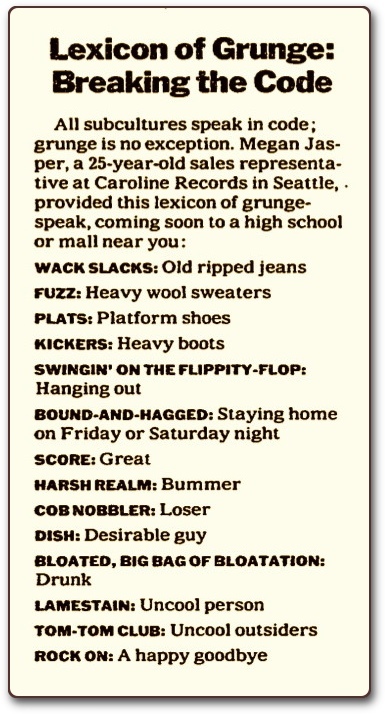 Grunge terms, according to the Times, included phrases such as Cob Nobbler (a loser), Lamestain (an uncool person), Wack Slacks (old, ripped jeans), and Swingin' on the Flippity-Flop (hanging out). Three months later, The Baffler, a small, Chicago-based magazine, revealed that the Times had been the victim of a hoax. The grunge terms didn't exist. Megan Jasper of Seattle-based Sub Pop Records (not Caroline Records, as reported by the Times) had simply made the words up. She was a receptionist working at the record company and had received the call from the Times's reporter. As he pressed her to reveal if there was any slang used by Seattle Grungers, she decided, on the spot, to invent some. The Baffler gloated that "when the Newspaper of Record goes searching for the Next Big Thing and the Next Big Thing piddles on its leg, we think that's funny." 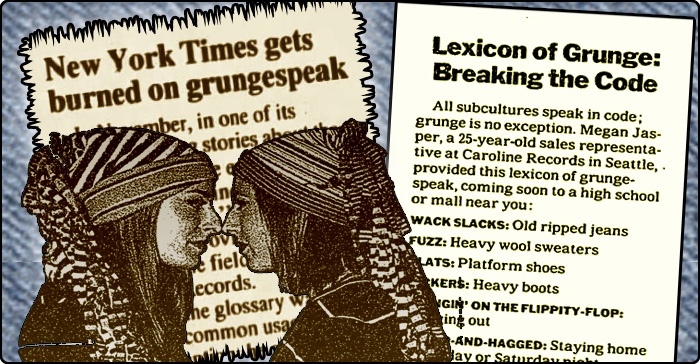 "Grunge speak" never caught on as actual slang. Although members of the band Mudhoney did subsequently use some grunge-speak terms satirically during interviews. "Those Cob Nobblers at the N.Y. Times," Globe and Mail, March 5, 1993, Section C1.